I am currently in Washington DC for the fourth annual gathering of organisations and thinkers from the English-speaking world - all broadly of the centre right - that are interested in developing new solutions to the problems of poverty. The gathering was launched by Iain Duncan Smith in 2005. This year, about thirty people from a dozen organisations and five countries are here. Britain's Centre for Social Justice, America's Heritage Foundation, President George W Bush's new Institute (which has already raised more than $200m), Canada's Institute for Marriage and Family, New Zealand's Maxim Institute and Australia's Kevin Andrews MP are some of the key contributors. A new website has been launched by the Heritage Foundation's Jennifer Marshall - RestoringSocialJustice.com - to track what we are all doing. It's early days for the website but over time we hope it will grow into a useful resource for all conservative people interested in tackling social problems that have defeated the Left. It will record policy thinking, profile key thinkers and case study effective programmes. Readers of the ToryDiary will know that I am seized with the enormous potential of compassionate conservatism and during this conference my excitement reached new heights. Deeper and deeper friendships are being formed by people who have given their lives to philanthropy, school reform, family policy, tackling crime and understanding welfare systems. An international movement is being built and the RSJ website will be its online home. Now that yesterday’s long anticipated defeat has been confirmed, America’s conservatives can grimly look forward to much criticism and unsolicited advice on what they have done wrong and where to go from here. Much has been written on this issue already, and the casual and more-than-casual British observer of American politics alike will be familiar with one often quite sympathetic view. According to this account, the Republicans succeeded in the 1980s and since with a small government and optimistic message, cunningly taking the votes of deeply religious voters but delivering nothing to them. But in recent years, the party has allowed the religious right to dominate policy-making and has let rip with government spending. Little wonder that the swing voter in America’s centre ground has now been alienated by reactionary social policies and fiscal profligacy. This analysis has much to offer in explaining how the Republicans have alienated media and cultural elites. But as an analysis of America’s whole electorate, it does not add up. As I have argued elsewhere, where Republicans have increased domestic spending significantly, it has been out of a reluctant but politically savvy recognition that they could not both oppose government programmes like free prescription drugs for pensioners - backed by nine in ten voters of all ages - and win the presidency. There are good reasons to be opposed to the bulk of the Bush Administration’s higher spending, but the notion that they were an electoral liability is not among them. On social issues too, the gulf between elite preferences and voters’ preferences is enormous. It is the elites who are most likely to find opposition to abortion or mass immigration offensive. As in Britain, the polls suggest the typical American swing voter is not a fiscally conservative social liberal but some kind of big government social conservative. The most compelling arguments on where the Republicans should now take things are coming from those who recognise this. 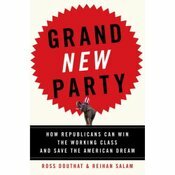 Ross Douthat and Reihan Salam’s Grand New Party is such an argument - and the best political book of 2008. Douthat and Salam, both excellent young conservative writers with no illusions about the failures and disappointments of recent Republican rule, have identified the American working class as the key to a new Republican majority. It is the needs and preferences of the non-college educated half of the American electorate, rather than those of metropolitan sophisticates, which must be heeded. The Republicans have had a good run of elections over the last four decades – even after yesterday, their tally is 7 presidential elections won and 4 lost. But Salam and Douthat show they have never had the sort of consistent governing majority enjoyed by Democratic Presidents such as Franklin Roosevelt and Lyndon Johnson: the working class swing constituency has kept on wavering, repeatedly denying Republicans lasting victories. Reflecting on David Cameron's leadership of the UK Conservative Party, Fred Barnes authors a cover piece for The Weekly Standard on what the GOP might learn from it. Don't ignore elites. The BBC and progressives have been cultivated. Are David Cameron's big ideas... big enough? In fact, the authors of “Nudge” acknowledge that their approach is both limited—“I don’t think we’re going to nudge Osama bin Laden,” Mr Thaler says, “but maybe we can make progress on litter”—and old, in practice if not theory. Lots of the techniques they recommend are commonplace in retail and advertising. Deals that begin with free samples, then require customers to opt out to avoid paying, rely on inertia. Adverts that cite the popularity of their brands harness “social norms”. Politicians are already at it too: “Nudge” is as much descriptive as prescriptive, adducing, among other initiatives, the opt-out organ-donation schemes in some countries, the cap-and-trade system of emissions control and a wheeze that improves aim in Dutch urinals. So it is perhaps not surprising that when the Tories try to set out the practical applications of their new thinking, the list seems short. They want a cooling-off period between a shopper signing up for a loyalty card in a store and his getting to use it. They want household-energy bills to let consumers compare their usage with the average. They want to use the tax system to signal society’s approval of marriage (as it formerly did)."